This PCL-5DsR L-Bracket from Sunwayfoto is CNC machined specifically for the Canon 5Ds and 5DsR. It enables you to quickly change from portrait to landscape orientation when using a tripod without readjusting your tripod head. The bracket is Arca-type compatible, including Really Right Stuff lever clamps, with dovetails on both segments. It is machined from aluminum, with a skeleton design to minimize weight. The edges where the bracket meets the camera body have a convex design to reduce unwanted camera twist. Two safety screws are located on the longer end of the bracket, preventing the camera from accidentally falling out of the clamp when adjusting it fore and aft. Two hex keys are included, one to remove or install the safety screws, and the other to attach the plate to the camera. A 1/4"-20 threaded hole allows you to attach a D-ring for a speed strap, or attach the bracket directly to a monopod. Box Dimensions (LxWxH) 5.6 x 4.6 x 2.6"
PCL-5DsR L-Bracket for Canon 5Ds and 5DsR DSLR Cameras (RRS Compatible) is rated 4.9 out of 5 by 8. Rated 5 out of 5 by michael from This is an excellent product The Sunwayfoto PCL-5DsR L-Bracket for Canon 5Ds exhibits excellent materials and fit and finish. It fits the 5Ds and 5Dsr which I believe use the same body design as the 5D Mark III. All ports and terminals are accessible with the L-bracket firmly attached. The 1/4-20 attaching screw does not have a circlip, so it can be unscrewed from the bracket and lost - dont unscrew it from the bracket. I did notice that the two safety screws were loose when delivered which means that they can loosen further with use and get lost - tighten them before use, even better use a product such as Locktite Blue and they will only loosen up when you want them removed. For the cost, this is an excellent product exhibiting fine design and workmanship. Rated 5 out of 5 by Gordon from Great buy I bought the L bracket for a Canon 5dsr. The bracket is semi permanently attached to the camera because there is no need to take it off to access the ports. The bracket provides clearance for the neck strap and does not interfere with the battery cover. 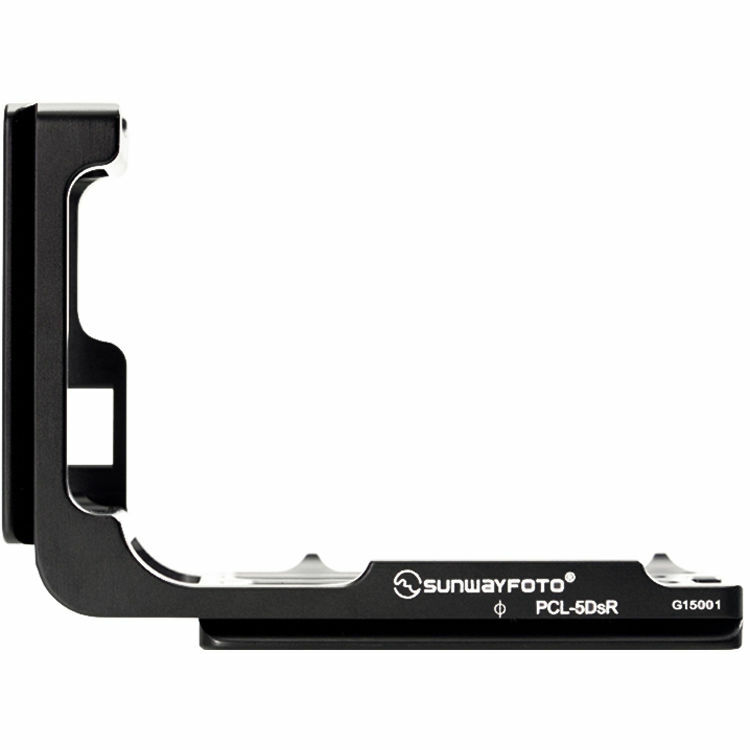 It provides clearance for shutter release cables and other cables into the camera ports. It was cheaper than other L brackets that don't fit the 5dsr as well. Excellent build quality. Rated 5 out of 5 by Bill D. from Similar to RRS but way cheaper I knew I'd need a bracket for my newly-acquired 5Ds R but wasn't looking forward to shelling out for another RRS unit. Cost is my only complaint for their products; they're rock solid and I've been 100% satisfied with them, but if I could get something indistinguishable for less than half the price then I had to give it a shot. So far, no complaints with the Sunwayfoto. Rated 5 out of 5 by instaimage from Nice product, fits nicely, nice finish I had a 5D3 Really Right Stuff bracket, didn't like the way it fit the 5DSR.... so I thought for the massive difference in price, I'd try this bracket. I don't use it often but when I do... this one will fit the bill for me just fine. It really is a nice product, I'm happy with the purchase. Rated 5 out of 5 by furbs01 google me from Well made product This L bracket is well made and well finished,fitted perfectly. It cme in a custom made box and lazor cut foam, packed within an outer box.It arrived prompty. Rated 5 out of 5 by Ranaldo from An excellent accessory This is a very good design. It functions good. It fits well, it is light weight and the cost is fair. Rated 4 out of 5 by Gary Hill from Well made product. No Issues. Good fit to the camera. Works with the RRS lever clamps as advertised. No issues after 3 months use. Will this work with a MOVO GH800 Gimbal? It will fit however they are not designed to be used with gimbals. The camera will be facing the wrong direction. Will this work with a tether cable on portrait orientation on the tripod? Does the bracket also work with the battery pack handle- add on? No it will not work. It is designed for a camera without the battery grip. Even if you could attach it, it would block your ports on the side of the camera. You would need one designed for use with a battery grip. B&amp;H does not show one for this manufacturer, but they do have a Kirk model that would work. Search for L brackets for 5DS R with battery grip . I have a markins head Q20, would this one fit? Markins claims that they are Arca compatible, so it should work. Hello, just to verify.Will this fit with a 5d MkII ? Not recommended. The bottom of the cameras are subtly different. If you were desperate you could get away with it as the screw does provide enough force to hold it in place. I would only do this in an emergency. Gary. Will this fit a canon t5i? I read the answer pertaining as to whether this will work on a MdMkII. Will it work on a 5dMkIV?